Topics: Rd Ram, and Ultra Wide. It is hosted by 4 Less Communications Inc (California, Chatsworth,) using Apache web server. comet.hosting4less.com, and ns2.hosting4less.com are its DNS Nameservers. 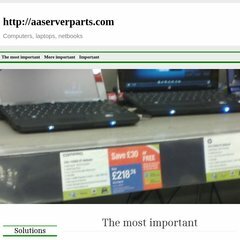 Aaserverparts.com's server IP number is 208.84.113.129. PING (208.84.113.129) 56(84) bytes of data. A time of 41.1 ms, is recorded in a ping test.